The Winter Wildcard is perhaps the most pivotal part of the season in terms of Fantasy Football, with not only bringing in the right players essential, but the timing of such moves is just as critical. Do you make the move early to avoid paying premium prices on the popular transfers or leave it late to get maximum information in terms of January signings and injuries? Here are the five main talking points that are affecting my wildcard decisions. There is no doubting that Sergio Aguero is the premier forward and don’t be surprised to see him in at least two-thirds of wildcard teams by the end of the window. He is currently in just eight per cent of line-ups at a price of £12.3m. Speculation is rife that he will make the bench for Man City’s next game against Arsenal and should this prove true, the floodgates will open in relation to his transfers. The decision for those hoping to play their wildcards late is to put up with a price hike or draft the Argentine in early as a regular transfer. Daniel Sturridge is also said to be closing in on a return to action and may prove an alternative for those willing to go without Aguero. The majority of midfields after the wildcard will involve at least four of the following – Alexis Sanchez, Eden Hazard, Cesc Fabregas, Raheem Sterling, Gylfi Sigurdsson, David Silva, Christian Eriksen and Stewart Downing. Aside from Aguero, the other two players to cause a slight headache are Theo Walcott and Angel di Maria, who are both just returning from injury. Di Maria has already returned three double-figure-point hauls this season across his first five games, where he only completed the 90 minutes twice to show his importance to Manchester United. Walcott looked a threat in his FA Cup start against Hull, but given he is unlikely to be ready to play 90 minutes for a couple of weeks yet, it makes sense to hold off for the time being. In the second half of last season only Chelsea and Manchester City conceded fewer goals than a Tony Pulis-managed Crystal Palace and now that he has taken over at West Brom, investment in a Baggies rearguard is tempting. Many already have Andre Wisdom, but he has competition with Christian Gamboa for the right-back berth, while any of Joleon Lescott, Craig Dawson and Gareth McAuley could start at centre-half. Crystal Palace and Newcastle will also be under new management and their settled starting line-ups are not yet known either, which is a reason to hold back with the winter wildcard. 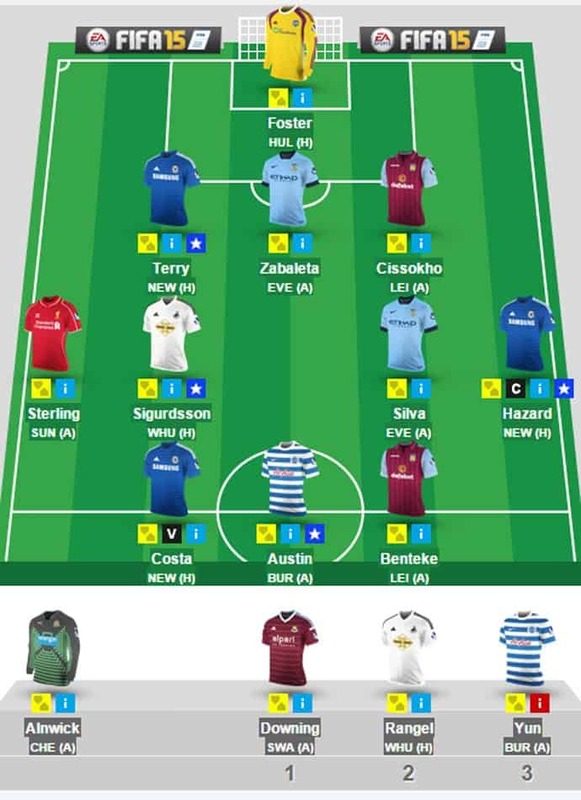 It is important not to think so much in the short term when playing a wildcard, as you want a base team that doesn’t need tinkering with for a while. Looking at February’s Premier League fixtures, Manchester City have a nice run of games, making it even easier to captain Aguero weekly. As for the weaker teams, Aston Villa, West Brom, Hull and Swansea have fairly kind fixtures too. Liverpool, Burnley and West Ham have a less appealing set of games and so this may be worth considering. Managers slow to jump on the Harry Kane bandwagon have already seen his price climb from £4.9m to £5.6m since the start of December and this shows no sign of slowing down. John Terry is another that has been a week-on-week price riser of late and so has Chelsea teammate Eden Hazard, who was £9.9m at the start of November and is £10.7 now. Expect Argentine pair Aguero and Di Maria to witness something similar, so judge your transfers shrewdly. Many managers will be looking at picking two cheap goalkeepers to rotate for the second half of the season and three budget defenders to rotate into one or two spots in a 3-5-2 formation. With this is mind, three strong rotations for the final 18 matches are Newcastle and West Brom, Aston Villa and Sunderland and Leicester and Hull. For example, either Sunderland or Villa are at home in 11 of the final 12 weeks, with none of the big six in sight, boosting the chances of a clean sheet for those that have Costel Pantimilon and Brad Guzan as their goalkeepers.